Smart or adaptive structures receive and process environmental information thus enabling them to react selfregulatively to changes of outer influences. This structural response allows compensation of undesired mechanical deformation for shape control, artificially increased stiffness or damping of vibrations and noise as examples of application. These functions require inherent sensing and actuating capabilities of the material. 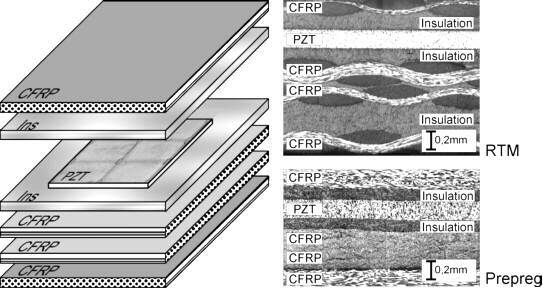 One possible variant of smart structures are fibre reinforced composites, for example, carbon fibre reinforced polymers (CFRP) with embedded piezoceramic patches as sensors and actuators. Furthermore, such structures offer new possibilities for a characterisation of structural or functional features. So, a further basic aim is to use the integrated sensors for health monitoring purposes to establish a continuous and integral inspection of the structure . In the following, the way to a structural health monitoring for the detection of impact damages with different techniques is outlined. Carbon fibre reinforced plastics (CFRP) with embedded thin piezoceramic patches as sensors and actuators are attractive for smart structures with regard to the manufacturing opportunities and material properties . In this way, light-weight properties but high stiffness and strength are combined with desired anisotropic mechanical behaviour and sensing and actuating properties in one material. Figure 1 shows a typical example of the principle layout of the employed CFRP-structures which are developed and manufactured by the German Aerospace Research Center (DLR). The plate-like composite consists of various layers with desired orientations of carbon fibres. Both, unidirectional and textile materials are used. Piezoceramic patches of lead zirconate titanate (PZT) are embedded within the CFRP layers. Typical dimensions of these patches are 30x50x0,2mm3. Insulating layers of polyester provide the necessary electric insulation of the piezoceramic. The overall thickness of the specimen ranges from 1 to 3mm. Carbon fibre rovings (fibre bundles) or a complete CFRP-layer serve as electric connections. Other implemented variations regard manufacturing techniques. So in addition to conventional prepreg-lamination technology (PP) a differential-pressure-resin-transfer-moulding (DP-RTM) was employed. Due to the occurrence of different flaws caused by manufacturing or developed during service a comprehensive non-destructive characterisation is obligatory. So, different damage mechanisms are revealed and early degradations of the mechanical, sensing or actuating capabilities are detectable. In this way, an optimisation of manufacturing and quality assurance during service is achieved , , , . In a first stage, as outlined in figure 2, conventional imaging non-destructive testing methods as ultrasonics, eddy current, radiography or thermography are applicable. Because of different physical effects they produce complementary information which results in a comprehensive description of the present status. Outgoing from this, it is possible to use the smart structure itself actively for the generation of signals for non-destructive evaluation (active techniques) in a second stage. An electric stimulation of the integrated piezoceramic provides the transmission of ultrasonic waves, thermal fields and electromagnetic waves. These are received by external arranged transducers and evaluated in a conventional way. By this, it is not only possible to detect flaws, but also to assess the functionality of the piezoceramic itself. The final aim is a health monitoring concept, where the integrated sensors are used in a self diagnostic manner to detect early damage stages. The integrated piezoceramics act as transmitter or receiver of the testing signals. Examples are the electric impedance spectroscopy  and methods, using the generation and receiving of ultrasonic LAMB-waves , . These methods are directed to inspect a certain area of the subject, to get a localisation of the damage and possibly further information about the damage. A main advantage is the continuous and integral assessment of a structure. As the scheme in figure 3 shows, the embedded piezoceramic is driven by an electric pulse and transmits ultrasonic waves in a broad frequency range. A conventional scanning probe receives this signals generated from the structure and so an estimation of the spatial distribution of the piezoceramic activity becomes possible. Additionally, flaws of the piezoceramic and in the covering CFRP- and insulation layers are detectable. Furthermore, structural features (in the shown example a local bending of the piezoceramic plate connected with cracks in the piezopatch) become visible, too. So this technique admits a very comprehensive characterisation of the structure . The visualisation of the thermal fields, generated by a harmonic electric excitation of the piezoceramic, can be accomplished using an infrared camera. The images in figure 4 display the effects of resistance heating in conducting rovings and vibration heating in the piezoceramic patches. The form and the position of the three piezoceramic patches become clearly visible at a frequency of 50 Hz. Furthermore, it is also possible to characterise other typical features of the material system. A single excitation of the piezoceramic patches with a frequency of 80 kHz was chosen, too, resulting in a predominant resistance heating of the conductor rovings (due to the decreasing capacitive resistance of the piezoceramic patches at higher frequencies). The bright lines show the track of the heated rovings and the bright shining points indicate weak spots . For electromagnetic methods, the actuator is driven by a harmonic electric source and produces consequently an electromagnetic field, which is detectable by external sensors. Here, the amplified output voltage of a commercial eddy current device at 2 MHz was used to feed the piezoceramic and a differential probe served as a scanning sensor. So, the normal component of the magnetic field was captured thus visualising the current distribution in the specimen. The resultant image in figure 5 shows the current leading rovings, the left-hand edge and a perpendicular crack of the actuator. A conventional X-ray image confirms this result. Due to the coupling of mechanical and electrical properties in the examined smart structures it should be possible to conclude from measurements of electric impedance to the existence of flaws. The demonstrated investigations ranged from low frequencies in the kHz-range to high frequencies of some MHz, as usual in non-destructive testing. Figure 6 shows the experimental setup, using a network analyser for electric control and measurement and a strip of CFRP-material as specimen. The impedance-frequency-diagram shows the broad band characteristic of the integrated piezoceramic. Resonance peaks in the lower kHz-range, resulting from vibrations of the specimen, become visible. These peaks are clearly correlated with special forms of vibration modes in length or width direction. Further experiments showed changes of the impedance peaks caused by impact damages. Beside amplitude changes mainly differences in the shape of the peaks were detected. The integrated piezoceramic patches are able to generate and to receive ultrasonic LAMB-waves which propagate in the plane of the plate-like structure. Unfortunately, different wave modes depending in their existence from the plate thickness to wavelength relation exist. Therefore at last two modes are possible at a distinct frequency. The different modes differ in their velocities and show dispersion, e.g. their velocity depends on frequency. Additionally to frequency and thickness the propagation characteristics of these waves are governed by the (anisotropic) material properties of the CFRP-structure. sensing detection of LAMB-waves generated by an damaging event (impact) with following localisation and evaluation (impact sensor). For these purposes basic experiments referring the generation, the reception and the propagation characteristics were performed. 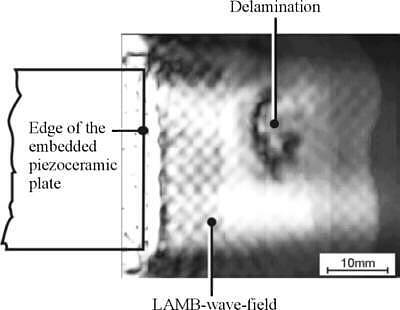 The results showed that the piezoceramic mainly generates the first symmetric and asymmetric LAMB-wave modes, dominated by the asymmetric mode. The edges of the piezoceramic patch are identified as sources, so that the complete signal displays a superposition of different waves. Figure 7 shows an example of a typical signal generated by the impact of a low speed impactor and picked up by an embedded piezoceramic. To confirm the detectability of flaws by LAMB-waves, a delamination in the CFRP-material was produced by an impact and the LAMB-wave-field in this region was scanned by an external transducer. In figure 8 the field distribution of the LAMB-wave, launched by the edge of the rectangular piezoceramic patch becomes visible and the area of the impact is marked by a lower wave amplitude. To achieve a comprehensive non-destructive evaluation of smart CFRP-structures different approaches are applicable. Outgoing from conventional methods, it is possible to use the active abilities of the material in generating signals for detection of structural or functional characteristics in a second stage. Examples are active ultrasonic, thermographic or electromagnetic methods. The final aim is a health monitoring system providing integral and continuous inspection. Different techniques based on electrical impedance or acoustic LAMB-wave propagation are promising. On the way to application, several questions ranging from basic relations between damages and measured quantities to appropriate signal processing and applicable measuring devices have to be solved. The presented work results from the project "Adaptive mechanische Systeme - ADAMES" of the Otto-von-Guericke-Universität Magdeburg, sponsored by the Deutsche Forschungsgemeinschaft (DFG). The support is gratefully acknowledged. Furthermore, we would like to thank T. Benziger, A. Hilbig and L. Beindorf for their assistance.